The more I study opera the more I learn about suspension of disbelief at least as far as writing goes, and the human propensity for engaging in it. Suspension of disbelief is a big thing in opera. It’s a natural given you are to suspend a lot of disbelief so the opera can move on. So what if the woman singing the role of a Viking is Asian? So what if two characters meet and fall in love in five seconds to set up the tragic ending? So what if a brother and sister, from the very same parents, are black and white? 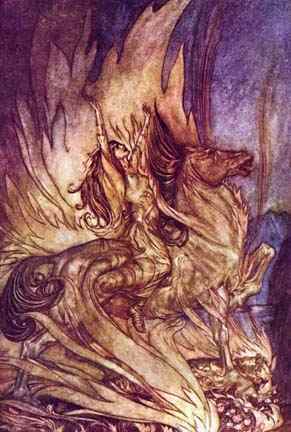 So what if Brunnhilde’s horse, Grane, NEVER makes an appearance during Gotterdammerung, even when she sings an aria to him and leads him into the funeral pyre at the end? It doesn’t matter. You take it on faith Grane is there even if you don’t see him. Now I’m not saying you can get away with this sort of blatant disregard in fiction. You can’t. But you can get away with a hell of a lot besides. Fantasy is chock full of stuff like this: magic, dragons, elves, demons, etc. SF is, too: time machines, faster-than-light spacecraft, stellar empires. All that stuff is garbage. The physical limitations the universe imposes upon these tropes are real and immutable. You can’t travel faster than the speed of light because it violates causality. Period. But we happily accept FTL spacecraft and other nonsense elements like telepathy for the sake of the story. That’s suspension of disbelief on both the part of the writer and the reader. And that’s what fascinates me from a human perspective. Our willingness, or innate need, to want to believe things that are manifestly and demonstrably not true intrigues me. Okay, you can kind of understand why someone would want to do it in order to be entertained. They are entering a contract with the writer when they pick up a story. But you can’t cross that line in such a way the story jolts them out of that prepared place they’ve put themselves in. Opera gets away with a hell of a lot, more than written fiction can, and I’ve yet to understand why, though I suspect it is because reading is entirely mental and opera has dependent qualities of visual and aural cues married to imagination. But both depend on the audience willing to put aside some degree of skepticism so the story can continue in a logical way. That’s the important thing to remember. I guess what I’m trying to say is people can be manipulated a lot easier than I originally believed. That’s a pretty strong lesson for any writer to have learned, and I’m glad I have learned it. Though there are still boundaries you can’t cross, suspension of disbelief is not the Rubicon I once thought it was.